…many of us have stopped paying attention to the world around us because we are too intent on following directions. Some observers worry that this represents a new and dangerous shift in our style of navigation. Scientists since the 1940s have argued we normally possess an internal compass, “a map-like representation within the ‘black box’ of the nervous system,” as geographer Rob Kitchin puts it. It’s how we know where we are in our neighborhoods, our cities, the world. 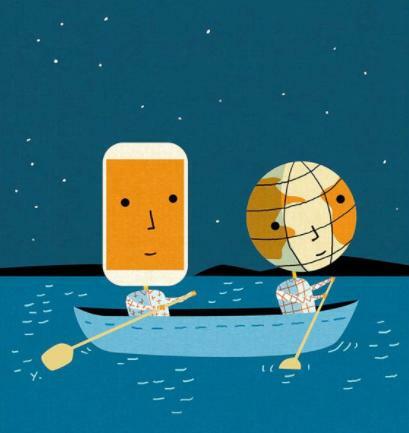 Is it possible that today’s global positioning systems and smartphones are affecting our basic ability to navigate? Will technology alter forever how we get around? As we follow the directions, we might recall that it was on this date in 1595 that Johann Kepler (and here) published Mysterium cosmographicum (Mystery of the Cosmos), in which he described an invisible underlying structure determining the six known planets in their orbits. 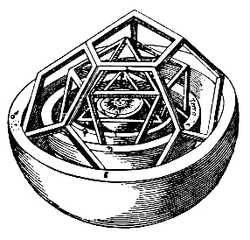 Kepler thought as a mathematician, devising a structure based on only five convex regular solids; the path of each planet lay on a sphere separated from its neighbors by touching an inscribed polyhedron. It was an elegant model– and one that fit the orbital data available at the time. It was, nonetheless, wrong.